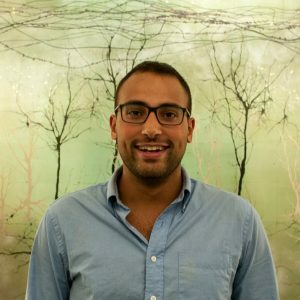 Jonathan Grima, a third-year neuroscience graduate student and National Science Foundation Graduate Research Fellow working in the labs of Jeffrey Rothstein and Solomon Snyder, was recently named the winner of an international scholarship competition hosted by the human cell culture company Axol. The scholarship application was a test of effective science communication skills. Applicants were required to submit an original article on a topical life sciences subject. For Grima, this meant delving into what he knew and loved best — neuroscience. His winning article, “An Important Biological Paradox the may hold the Key to Understanding Age-Related Diseases such as Neurodegeneration,” delves into the large body of research focused on the origin of age-related diseases with a central focus on nuclear pore complexes (NPCs). Jonathan Grima strives to become an expert and leader in neurodegeneration and neuroprotection. NPCs are the largest protein complexes in eukaryotic cells, made up of multiple copies of 30 different proteins, and they serve as the only channel between the nucleus and cytoplasm. These complexes are tasked with regulating the flow of molecules in and out of the nucleus, which is a key step in numerous cellular processes, including gene expression. The long-lived nature of these complexes leaves them open to potential accumulation of molecular damage, which could have deleterious effects on their function. This makes NPCs a hot target in the search for the cause and treatment of age-related diseases. Grima’s interest in neuroscience had a surprising start. While attending high school at a campus once wandered by great actors and actresses, like Jennifer Aniston and Robert De Niro, Grima explored the performing arts, though he always kept a scientific career in his sights. The introspective process he underwent to delve into the mind of each character he played in order to understand their motivations and thought processes sparked his fascination with the brain. He pursued that interest at the University of Rochester, where he majored in neuroscience and minored in clinical psychology. His desire to make a difference in the field of neuroscience eventually led him to the hot spot of neurodegenerative disease research being conducted at Johns Hopkins. Winning the Axol Science Scholarship came as a surprise to Grima since it was his first foray into science writing. Though he has not had any formal training, his experience in theater helped him develop communications skills that cross all disciplines. They certainly served him well, as his written work is now featured on the Axol Science Blog! It is that sort of mentality that will serve Grima well as he continues his graduate studies and eventually begins his own academic lab in the pursuit of having a significant, positive impact on the millions of people affected by neurological disorders. 7 Comments on "Neuroscience Graduate Student Awarded Axol Science Scholarship"
Jon Grima is the man. Yo you da man, Grima! Keep doing big things. So proud of my nephew! You sure got nannu's DNA when it comes to brains. He is rooting for you to find solutions so no one else has to suffer like he did or at least make things a bit more bearable. Congrats and all the best for the future. The work you are doing is important for the future in science and medicine. Great job! hey Grima fans, don't forget, next week is our first fan club meeting!